I'd been thinking about rearing some meat birds for a while. 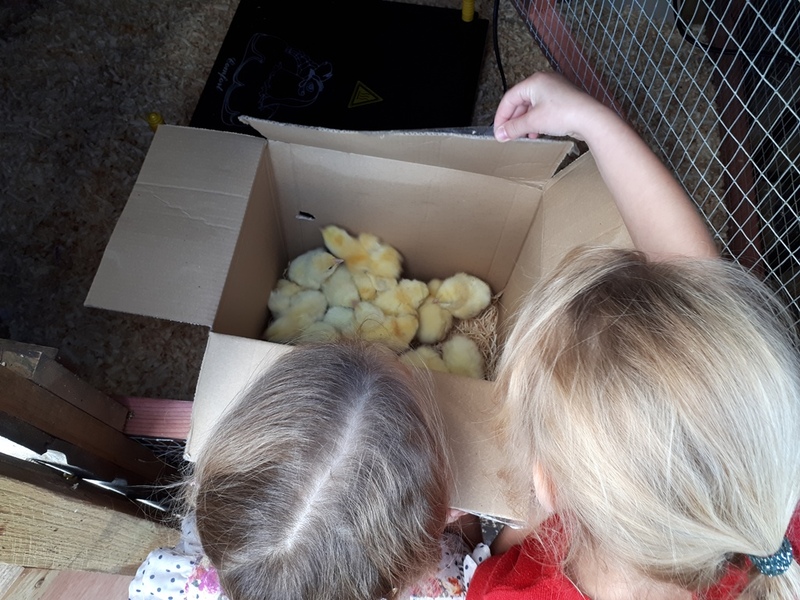 I decided to do it when batch of eggs I'd tried to get a hen to hatch out failed earlier in the summer, we always hatch some chicks out every year as I think it's great for the kids so I was really disappointed. 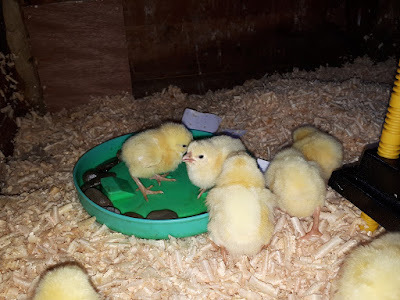 So I decided to buy some day old meat chicks and rear them in a brooder, this is far more work than just raising them with a broody chicken, as she takes care of all their heating needs, but I haven't got any broody hens so it was my only option - short of sitting on them myself. To do it I was going to need a pen and also a means of keeping the chicks warm. Doing some research online I came to the conclusion that heat lamps were quite energy hungry and an "electric hen" or heating plate might be the way to go. 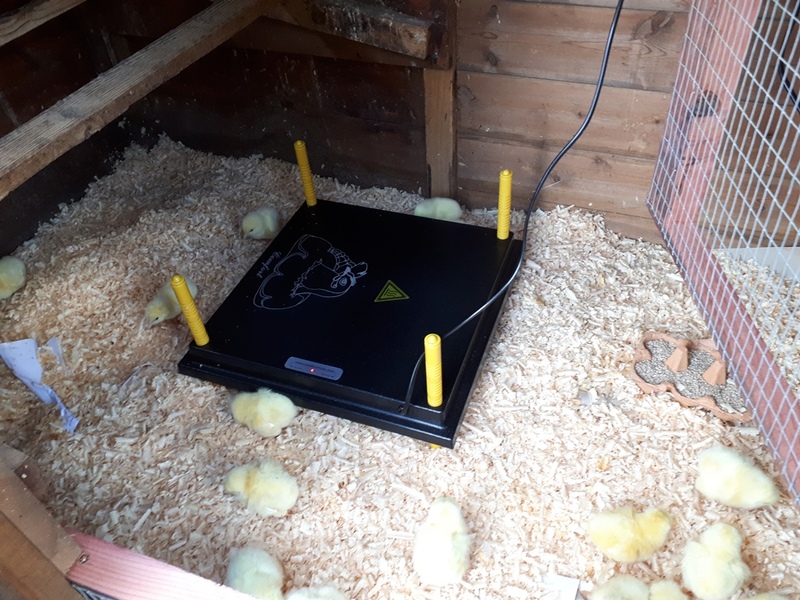 Here they get heat from above with the plate as they would with a mother hen and it's only 42 watts rather than a big heat lamp. Also the risk of fire is much lower (I used to hate when we had heat lamps in the sheep shed when I was growing up on the farm - all the straw and hay around them made it so dangerous). I then set to work on finding a pen to house them in. I have a few coops not being used at the moment as my laying hens are in their pastured chicken tractors. 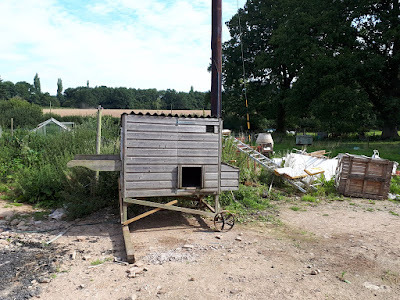 I decided to move the better of the two coops up to my yard with the tractor and then make a few alterations to it. I adapted the pen, I made up a mesh screen and a mesh door above. 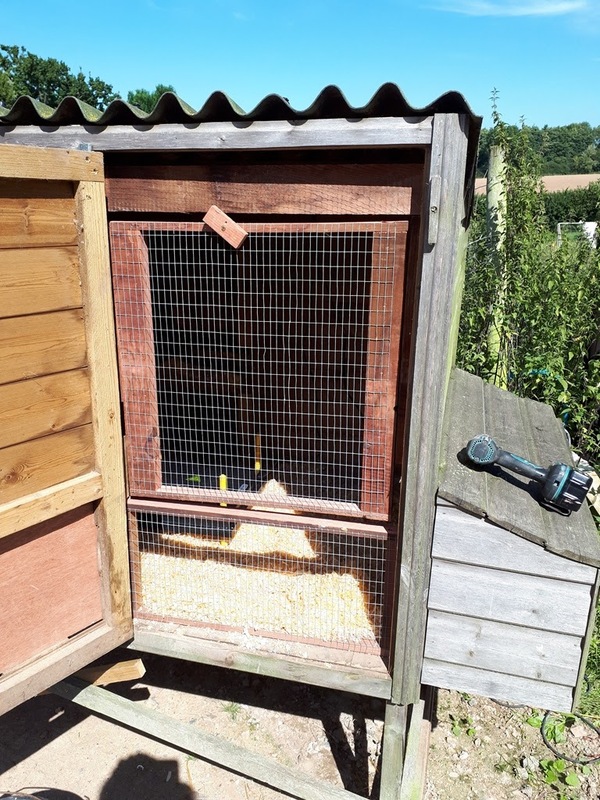 This meant that I can leave it open in the day and the kids can see the chicks without them escaping. 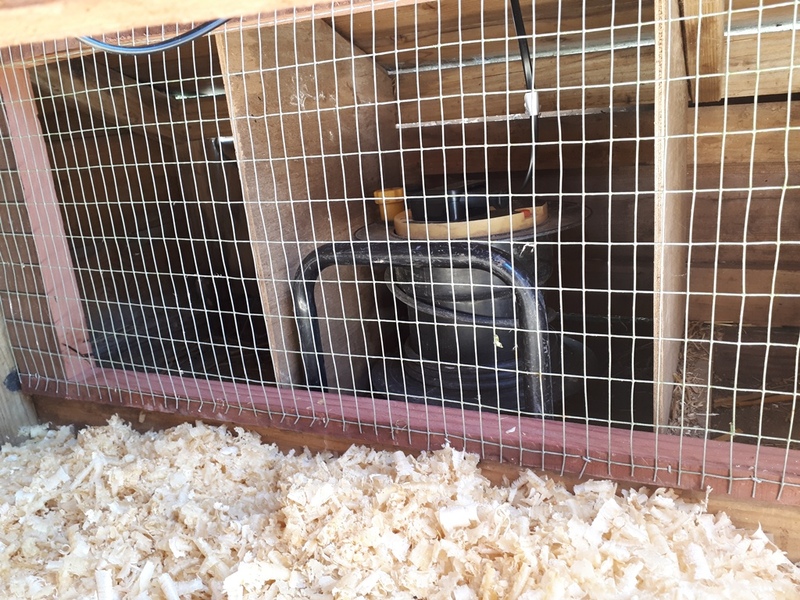 I also made a mesh screen for the nest box and hid the extension reel in there. 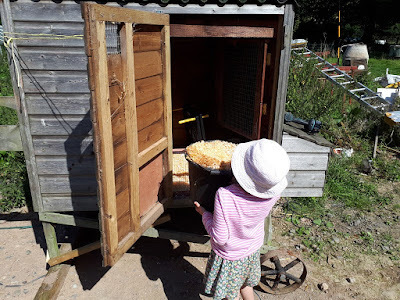 No shortage of wood shavings for bedding around here at the moment - advantage of being a carpenter. 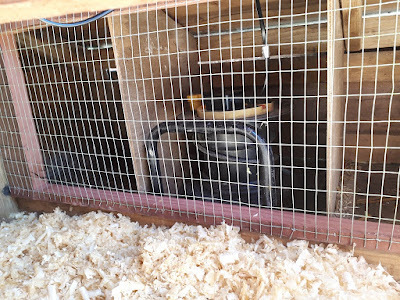 I shall make an extension for the pen as the chicks grow and they'll go outside at five weeks old into a pasture pen. The kids were so excited when I turned up with them on Wednesday night! lots of jumping around! 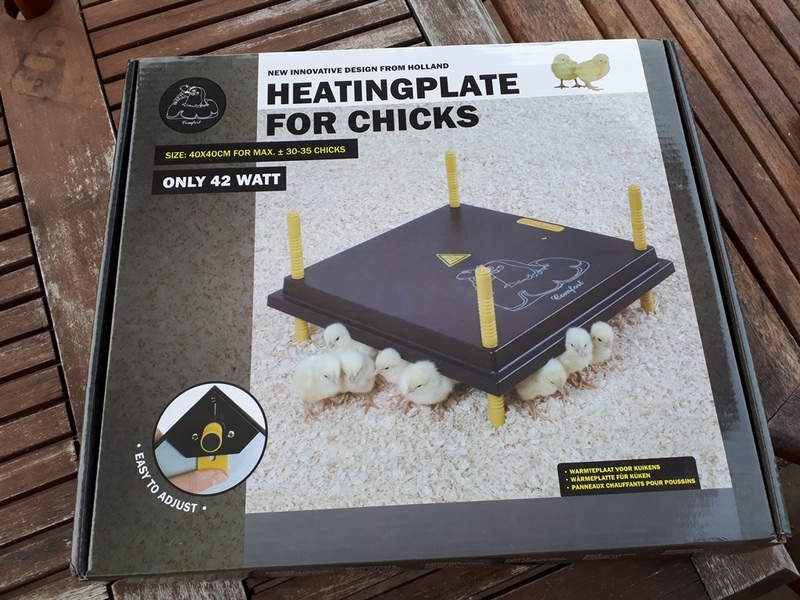 The chicks took to the heat plate straight away and know to go there to get warm, having the mesh door open gives them plenty of air flow and light as well as hopefully hardening them up a little faster. 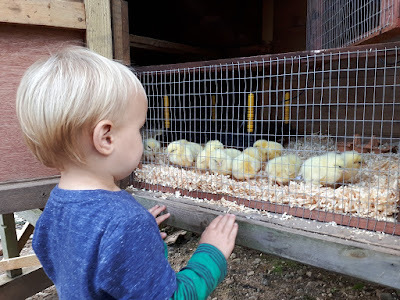 The kids are loving them and got to check on them many times in a day! 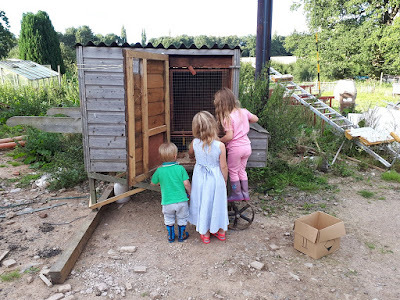 But they also know that these birds are to eat and both have expressed an interested in helping me prepare them when the time comes, I won't force them but if they want to help then I'll let them, maybe with plucking to start with. So now I've just got to keep them alive, healthy and well fed for the next 10 - 12 weeks. It's another small step in the self sufficiency learning journey that we're taking here. 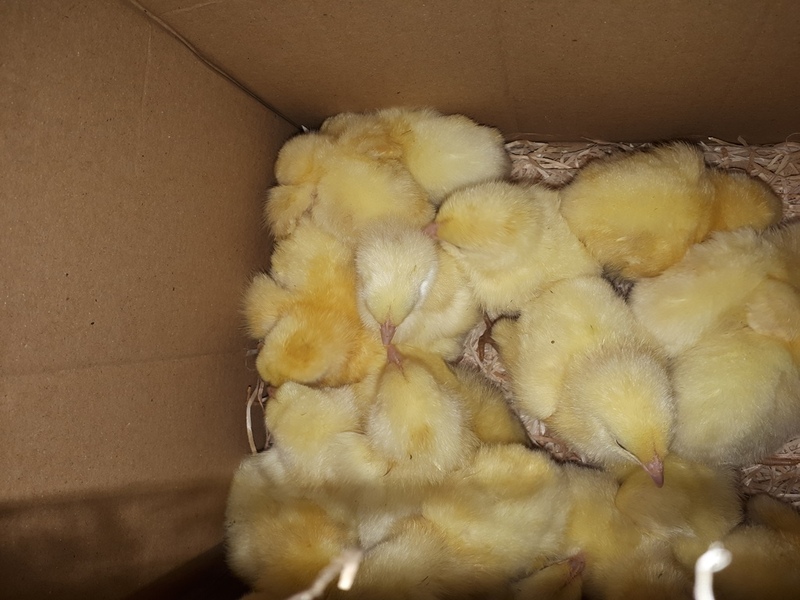 As a reliable means of meeting our chicken meat supplies we get batches of 20 day old chicks at a time to grow on. We have just dispatched the last lot at between 12-15 weeks. We process two at a time so spread it over a 2-3 week period. They averaged 3.4 kilograms. They are definitely superior to the standard supermarket chicken and are cost effective to produce. The last time I calculated it they worked out at £2.40 per kilo. That's pretty good, I'm hoping to do roughly the same here with these birds. I've got some friends interested in helping to process them so maybe do a "chicken club" where I breed them up and people buy the live birds off me. Not sure yet. Looks a good set up Kev. Is it easy to dispatch them when they are ready for the table? I've never struggled with that side of things. Not pleasant but it doesn't bother me either. They look so cute. The heat plate is a great idea. looks like a great set up, should be fully feathered 3-4 weeks then you can take them off heat, our second lot are growing at a pace. Yeah, I might make the pen a little bigger as the more space the better I think, especially if they can have more time away from the heat so they harden up faster. Not Wasted Time - Conversation Is Important!